I got a copy of the HQ² mixes of WIDELIFE's "ALL THINGS". I would say, after such a long wait for this somehow "come back" remix, that i am kind of disapointed with it. 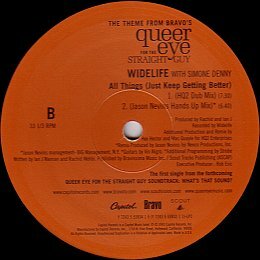 Yet, since i had never seen or heard the Queer Eye TV show, i thought it was a good start to appreciate this HQ² mix without associating the song to a silly reality TV show theme and its characters. But, unfortunately, the "HQ² magic" doesn't seem to work this time... Not that i expected a memorable remix coming out of a TV theme (even with the great talent of both Hex and Mac) but i thought the dub could have taken the remix to a new, maybe darker, edge. Actually, the dub is less or more an instrumental version of the remix... For those of you who still did not get a chance to hear the remix, click the pic to reach a 2 mn audio sample. 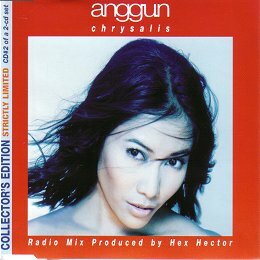 I also got a CD single from indonesian artist ANNGUN. Her song "CHRYSALIS" was remixed by Hex and Mac in early 2001. I got the second single of a 2 CD set which features unreleased HQ² material such as the "Pop A Capella" and also a full lenght VIDEO of CHRYSALIS with the HQ² mix in it . This video looks just GREAT !!!! I know there is also a french version of the HQ² Pop Radio Mix called "TU MENS" (you lie) that was featured on an indonesian compilation but i couldn't get myself a copy. You can click the pic to get more details. First, let me wish you a HAPPY NEW YEAR !!! Still no sign of a release for Hex's mixes of BLU CANTRELL's "YOU MAKE ME WANNA SCREAM". 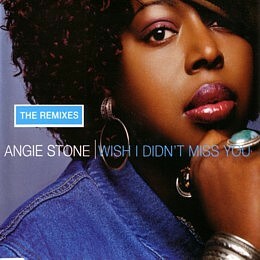 The first one is an Australian promo CD of ANGIE STONE's "WISH I DIDN'T MISS YOU" featuring 6 HQ² mixes, including two radio mixes and the Dub only available on vinyl. You can click the Pic to get to the detailed track listing. The second one is a U.S promo CD of COOLER KID's "ALL AROUND THE WORLD". It features the same tracks as the vinyl but here you get the Hex Dub (not released on the domestic CD single) in CD quality.